David Perolman is an educator with a strong Jewish and musical background. He has been actively involved in NFTY, URJ Camp Harlam, and has taught/song-led in numerous synagogues across the east coast. 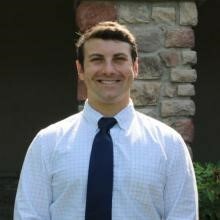 David brings a deep, committed Jewish soul along with keen organizational programmatic skills to our Religious School. After receiving a Bachelor’s degree in Communications, David found his part-time positions in teaching to be more fulfilling than his full-time work in sales and marketing, so he returned to graduate school. David earned a Master’s degree in Education with certification for Teaching in grades K-9 and then spent several years teaching in a secular classroom. He also worked as a Music Director at a synagogue in Maryland. Most recently, David served as the Assistant Director of K-12 Education at a 1,200-family synagogue in the suburbs of Philadelphia. There he was able to craft programs that met the needs of his students, specifically in the post-B’nai Mitzvah program. In addition to his passion for education, David has a great love for music. He is a talented musician, singer, guitar player and composer. Growing up in the Reform Movement, he was active in NFTY, was a NFTY-MAR (North American Federation of Temple Youth – Mid Atlantic Region) songleader, and was exposed to much of the popular music of our movement during his years at URJ Camp Harlam. His passion for music is apparent to anyone who witnesses his energetic joyful songleading. David lives in Barrington with his wife Danielle, and daughters Ariel and Sydney.